Conspicuous. Eye-catching. Ready for book covers, for large formats, and text needing panache. 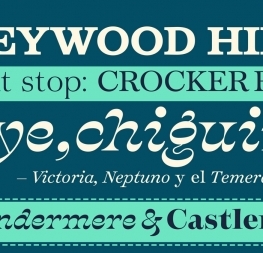 Based in English lettering traditions, Temeraire rescues disparate styles from echoes in time. We know you’ve waited a while and now Quentin Schmerber’s Temeraire is available! Some type families are subservient companions, but Temeraire intends to turn heads and draw readers in with some wonderful alternate glyphs among its five styles (Regular, Italic, Bold, Italienne Italic, Black Display). Did we mention this type family won our third Typeface Publishing Incentive Programme? Try each winning style in our type tester, then toss your copy in your cart.